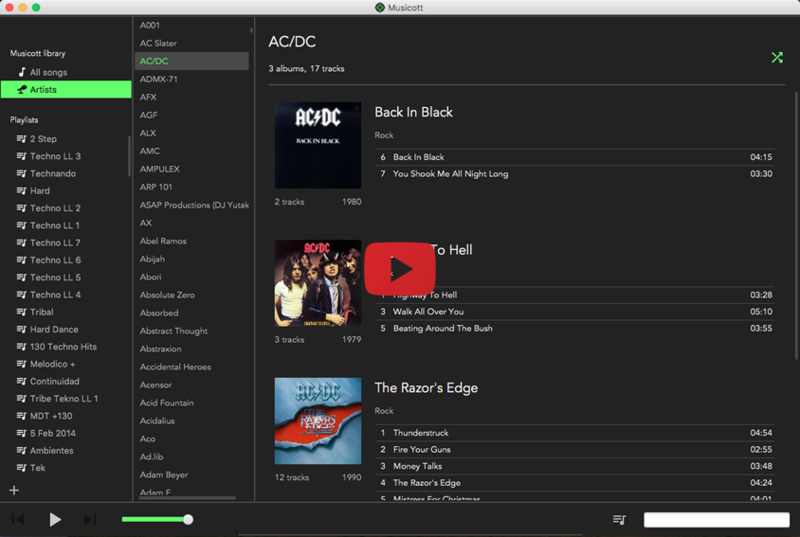 Musicott is an application that manages and plays music files. Coded in Java 8 with JavaFX. Uses JAudioTagger to read and write the metadata, Json-io for persistence, TestFx for testing, Guice for dependency injection and some components from ControlsFx. I had some trouble creating the native packages and even the jar file, since now the project is structured in several modules. I will work on it and I will upload the release packages when I’ll achieve this. Running as described as described in the following section is the recommended way. Check out the Wiki pages for help about using Musicott. Improved Itunes import. Now the application shows a window to let the user selects which playlists to import. Refactored with guice’s dependency injection framework. Refactored to use maven multi modules. Added Artists navigation mode. A list of artists is shown, and clicking one artist shows their albums, with useful information of them. Typing on the search field while on the artists mode filters the artists list by the query. Copyright (c) 2015-2017 Octavio Calleya. This page is maintained by Octavio Calleya.